Here is the panel abstract, followed by the slate of papers and their titles. For those who read my recent piece in The National, much of what I’ll be saying will sound familiar. The category of “world music” has been identified with ethnomusicology since the late 1950s but was powerfully reworked in the 1980s into the industrially-produced genres of “world music” and “world beat.” In recent years, independent redistributions and online circulations have revitalized “world music” with raw materials derived from a global array of previously underdocumented regional popular styles. But these emerging media ecologies of world music (sometimes described as “World Music 2.0”) disengage from the top-down marketed collaborations and smoothly hybridized visions of the 1980s and 1990s. Instead, new productions reorient the ideologies and ethics of world music toward the discourses of “open source culture,” free informational exchange, and participatory democratic access enabled by digital media and online distribution. Accordingly, the notion of what “world music” sounds like — and the picture of the world it entails — increasingly maps onto new global imaginaries of the popular, sometimes decentering the term’s consumer lynchpin: the autonomous Western listener. However, despite the possibilities of more horizontal (if not peer-to-peer) revisions, critical problems of participation and power remain in familiar as well as new forms. While new media ecologies offer increased opportunities for inclusion and exchange, they simultaneously create novel patterns of exclusion, difference-making, and vulnerability at crucial nodes of shared access. This panel will question how globally popular platforms like YouTube enable or undermine the collective stewardship of world music, how digital modes correspond with more established commercial routes of musical circulation, and their challenges to ethnomusicology’s existing discourses of musical culture. 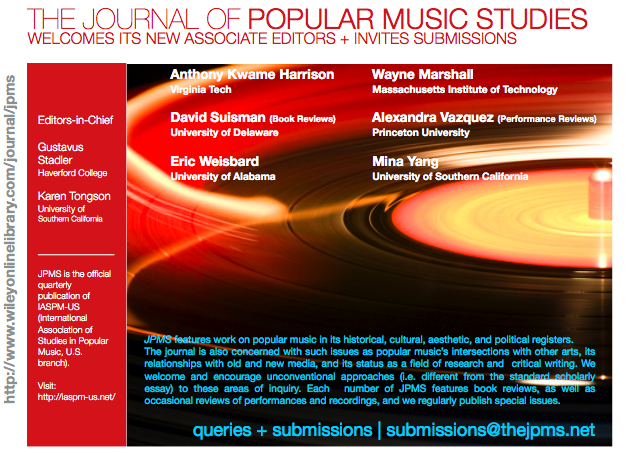 I’m happy to announce that I recently joined the team of associate editors at JPMS, or the Journal for Popular Music Studies, which is the quarterly publishing venue of IASPM-US, or the United States branch of the International Association for the Study of Popular Music. Now that I’ve got that mouthful out, let me tell you why this is important to me and worth your interest — that is, if you fancy yourself a scholar or student of popular music. Depending on one’s language, methods, and audience, there are lots of venues for writing about popular music today, from the classic sites of music journalism (magazines, newspapers), to the world of blogs and tweets and tumbls, and including an increasing number of academic journals. All of those are fine venues, in their own way, and depending on their paywalls (or lack thereof), they all can serve to amplify ideas, share research, and work to reshape the ways we think and talk and write about music. I’m glad to note that JPMS stands alongside many similar efforts, including Popular Music, Popular Music and Society, and nowadays a host of online and grad student-edited journals. All of these serve as supportive — and increasingly bold and accessible — platforms to stage rigorous peer-reviewed discussions and debates about the significance, meanings, and effects of popular music, very broadly construed. The “broadly construed” part is crucial, and I know my co-editors are in agreement about the diversity of approaches and topics we’d like to invite. It’s also important to me that the journal be broadly accessible — a public platform of sorts, to be read by people outside of popular music studies per se. Of course, being an academic journal, still embedded in a particular publishing regime, there will be inevitable constraints on our best wishes. But while we realize that an academic journal faces certain problems of access and professional requirements (i.e., getting people tenure in disciplines), we hope to cultivate JPMS as a space from which a broadened and more critical understanding of music writing might be generated. Journal of Popular Music Studies features work on popular music in its historical, cultural, aesthetic, and political registers. Its purview encompasses all genres of music that have been dubbed popular. The journal is also concerned with such issues as popular music’s intersections with other arts, its relationships with old and new media, and its status as a field of research and critical writing. We welcome and encourage unconventional approaches (i.e. different from the standard scholarly essay) to these areas of inquiry. Each number of JPMS features book reviews, as well as occasional reviews of performances and recordings, and we regularly publish special issues oriented around a particular topic, co-ordinated by a guest editor or editors. 1. Provide a hospitable place for scholarship that departs from strictly “discipline-based” approaches to popular music. 2. Encourage writerly approaches to popular music. We want to locate and feature the passion in the projects we publish, and to that end, also hope to encourage non-academics, independent scholars, journalists, venerable aficionados, to submit to JPMS. Indeed, the disciplinary intervention of pop music studies comes not only from WHAT we write about, but HOW we write about it. venerable old organs of the profession), we have the opportunity to make JPMS a place to explore new directions in pop music and scholarship about it. 4. Enjoy an expanded (and redesigned) web presence. With regard to the last point, I like what Social Text has been doing, for instance, and I think that in general we could grab some pointers from contemporary blog and online magazine layouts. (The current setup is dismal, clinical, and difficult.) The drab physical product could use some retooling too. There’s no reason a journal about pop shouldn’t itself also pop. And there’s no reason JPMS’s archives and current content shouldn’t be easily navigated, accessed, cited, and so forth. Of course, one reason certain things will be slow to change is that journals like JPMS are rather institutionally entrenched. I confess that working for one of these pay-wall journals is a deeply ambivalent undertaking for me, especially at this stage of my fledgling career. None of us get paid directly for the labor that goes into producing this journal. (Rather, we get paid by universities who expect us to spend some of our time this way.) And yet readers must pay a middleman publisher in order to access the fruits of our labor. Via library subscription packages, the universities that pay our salaries are made to subsidize scholarly production twice over. And don’t get me started on the towering ivory paywall standing between that privileged but pricey university access and the greater public. The OpenAccess movement and ordinary, proactive sharing practices are helping to erode such walls, but there remains a long way to go. Essentially, associate editors are responsible for suggesting appropriate peer reviewers for essays that overlap with our areas of expertise, and we’re encouraged to bring to the attention of the Eds-in-Chief any new work, academic essays, or experimental writings that would be appropriate for the journal. I’m also happy to consider experimental non-writings if anyone has ideas along (outside?) those lines. Lamin Fofana, “Happy 2010 // Dark Days Are Coming” from Dutty Artz on Vimeo. 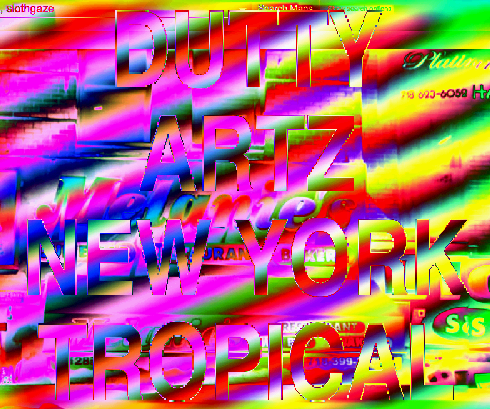 Also apropos: Lamin’s peoples, Dutty Artz, have finally released their New York Tropical compilation. DA is one of the few posses I’ll give a pass for using so hackneyed and vague a term as tropical — for years a bland music-industrial category (dare I say ghetto?) for certain Caribbean/Afrodiasporic genres — not least of which because their notion of what it evokes seems like such an idiosyncratic, inspired articulation of the city’s sounds and spaces, contours and forms, not to mention the shapes it might yet take on. 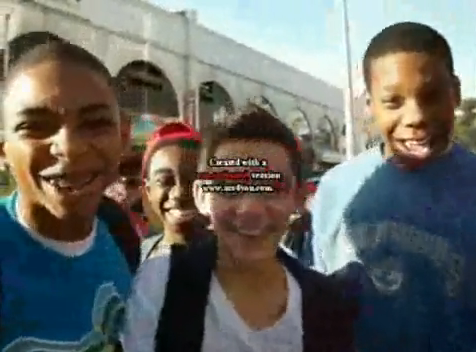 Jury’s still out on who that guy with the dreadlocks is. My student assumed it was Bob Marley. Now he knows better. How is it that it took until this past weekend for me to stumble upon* this utterly bizarre, Bill Laswell-produced, hip-hop-infused 1987 version of “Boops” by Sly and Robbie?